I was hoping to have this in time for the Bristol GTG but it has been delayed so here's a preview, using the seller's photos obviously. 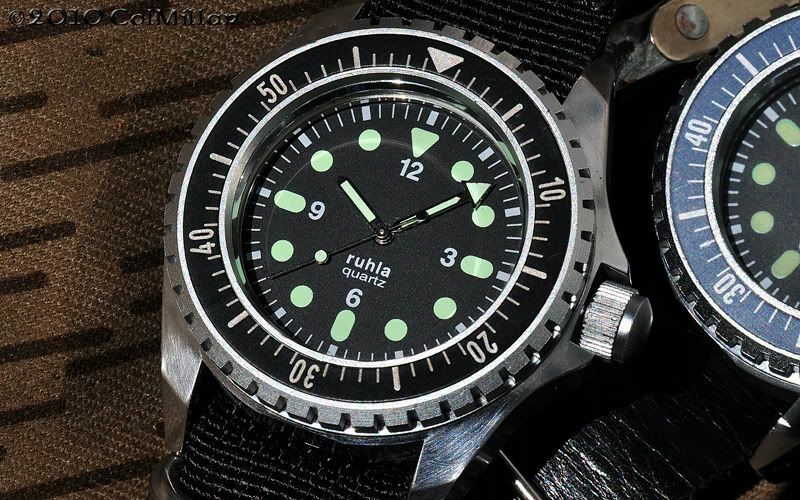 Curiously, the Ruhla has a tenuous link with the Sinn EZM 1 (see below). In the late '80s Ruhla produced these massive divers' watches for the East German military, including the elite combat divers and swimmers of the NVA (Nationale Volksarmee). 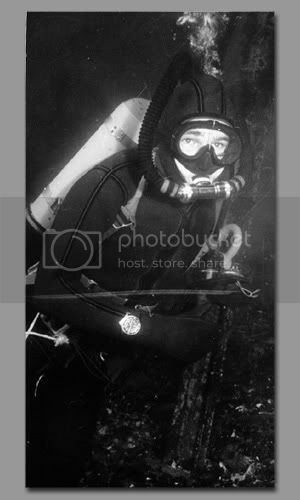 The Kampfschwimmers were probably the East German Navy equivalent of the SBS, a group of divers "Perfoming armed missions at the shoresides, harbours and in close distance to the coast". They were renamed "Spezial Taucherkommando" in 1959 then regrouped in 1960 to form "Kampfschwimmerkommando 18" (KSK-18). Their base was the East German harbour town of Kühlungsborn, on the Baltic. In 1990 KSK 18 was disbanded along with the rest of the NVA, due to the re-unification of Germany. 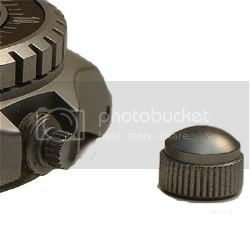 No-one knows how many made but there are two different types of dial. Mine is the more attractive earlier version. 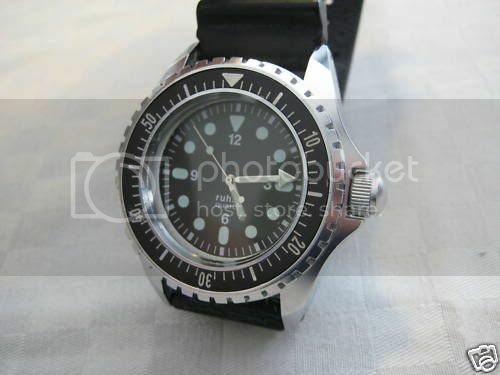 There is an excellent database for these watches ( http://www.ephemerol.de/ruhla/index.htm) which lists just 25 known examples, excluding mine, although one listed is possibly a reissue (see below). Number 702 shown above is the third earliest recorded. Although primarily for the Kampfschwimmers, one Ruhla has turned up which was issued to the East German border patrol so you could think of it as a kind of East German Sinn EZM 1? P.S. 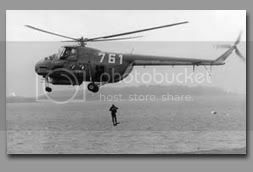 I have borrowed some of the photos from the excellent NVA Ruhla source mentioned above, which has been produced by Jan Claas van Treeck. I trust that Jan won't mind as I am trying to raise awareness of these rare and interesting watches. Last edited by StampeSV4; 21-11-2009 at 15:51. Thought you might say that Al', as it was your suggestion (and a very good one too)! Wonder what they will look like next to each other? Quality and quantity? It will also be interesting to compare it to my CWC SBS, the British equivalent. Last edited by StampeSV4; 21-11-2009 at 16:11. The EZM-3 is much smaller in every dimension, will try to get a comparo photo when the new Ruhla arrives. The design obviously lent some influences to the Dreadnought (bezel, general case shape). 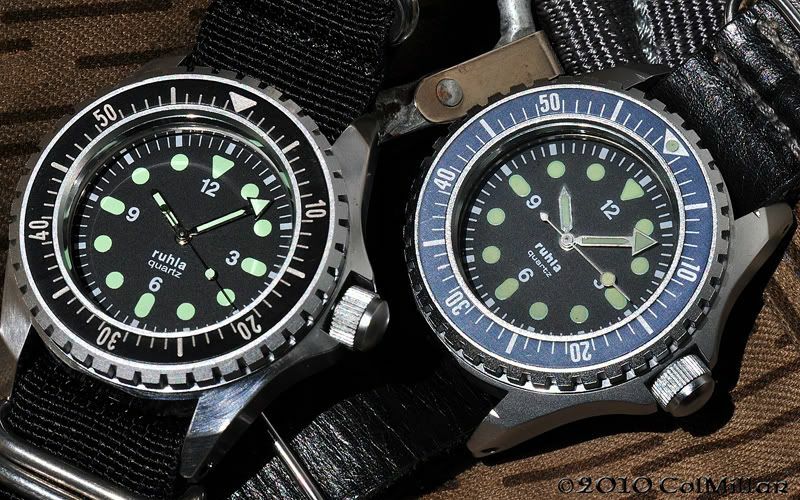 These are fun watches for the mil diver collector and one of the less expensive to grab. The crown cover is a bit of a pain, they should have anchored it as per SOP for the canteen designs. The backs of my two, more pics to follow. Some interesting changes occurred between the earlier and later watches. That's interesting, Colin. I recently sent mine to Al' for a battery change and he discovered that the caseback was not on properly - I thought it was wrong when it came back because the engraving was upside down but it turns out it can only be fitted one way up if you want it to seal, which it now does - I gather that there is a sort of slot and key arrangement with the caseback and a locking ring. If you look at the photo of mine above (taken by the seller) you can see that the caseback looks like it is the right way up but actually it's not sealed - thanks to Al' the watch is now perfect. I see that your early watch also has the caseback fitted correctly (hence the crown appearing on the "wrong" side in your photo, which is the same as the example in Billy's book. N.B. 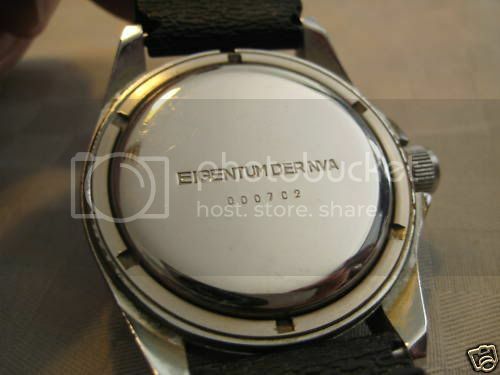 the one in Konrad's book is a "reissue" as found on ebay and the caseback engraving he shows is actually from a stopwatch several pages earlier in the same book, not from the "reissue"). Look forward to seeing a few dial shots too? Thanks for that info Jon, very helpful! Unfortunately, the watch which is correct is the one which needs the battery, which means I have to open both of these $%#^&*! I'm finding the differences interesting. 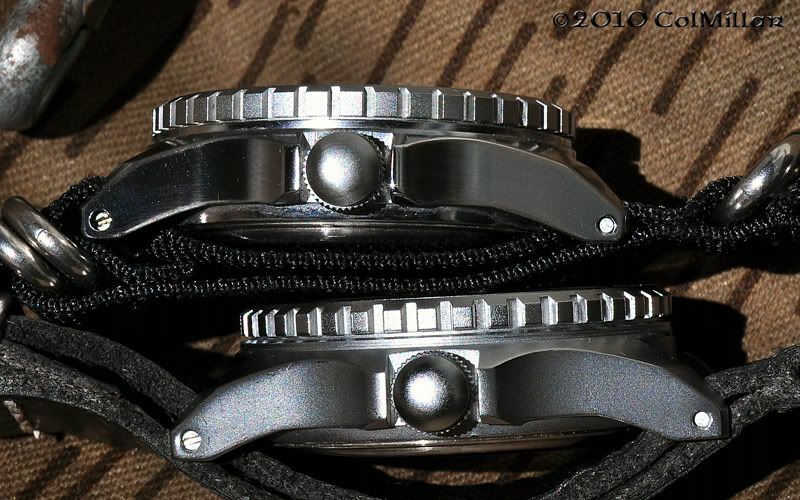 The later watch has a brushed case and the dial/hand lume is either completely dead or absent - the latter I believe. 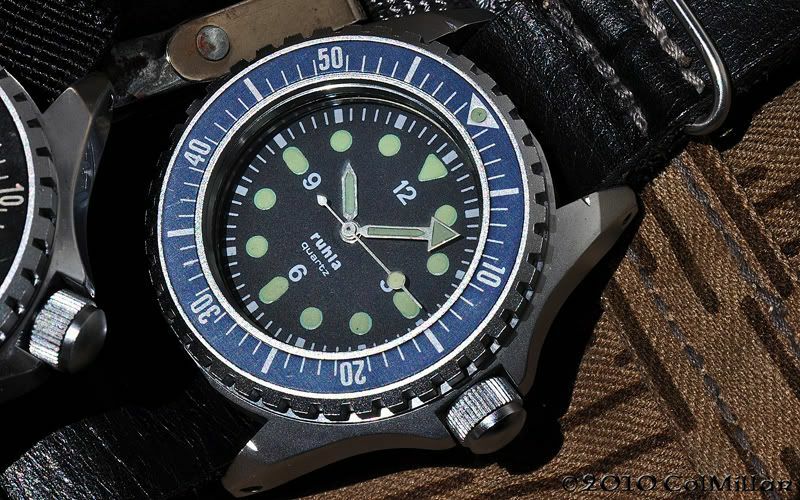 With no lume in the bezel insert, I'm wondering whether this one is a franken. I bought it a couple of years before the reissues came out, so? I need to review the site which lists the differences between the watches. This is interesting. 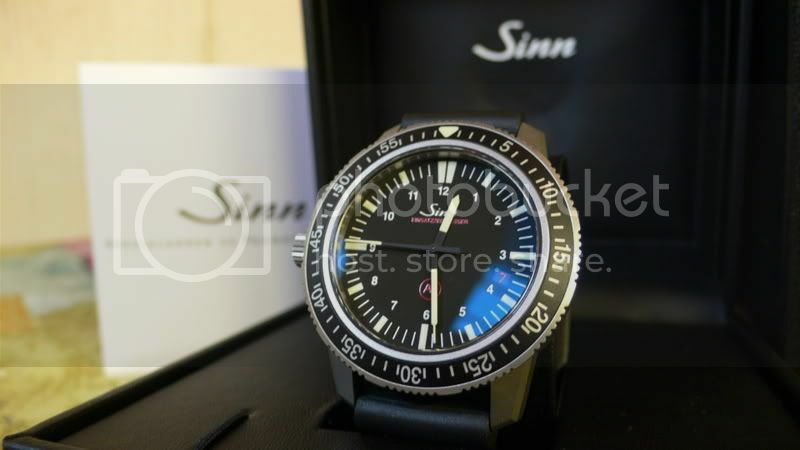 I gather from Jan's site that the very early versions had a dot of lume at 12 - the latest with lume he's seen is no. 228 - then it was deleted (it's absent from mine which is no. 702). They also have a distinctive ball on the balance end of the stick and ball second hand. 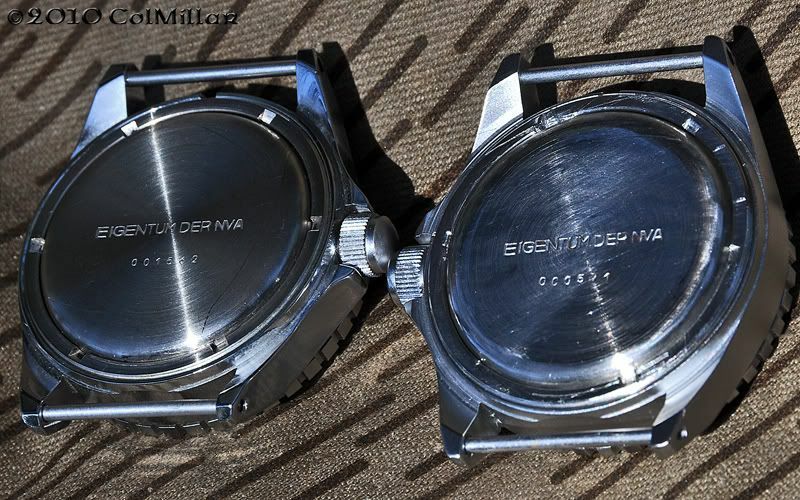 The caseback numbering usually seems slightly wonky too! I did spend time noting all the differences before I bought mine and I offered to share that information (see my first post above) but no-one responded - now I can't remember them all?! Last edited by StampeSV4; 13-06-2010 at 09:51. I'll email him about #571's bezel and ask him about the spade-shaped counterbalance on the seconds. 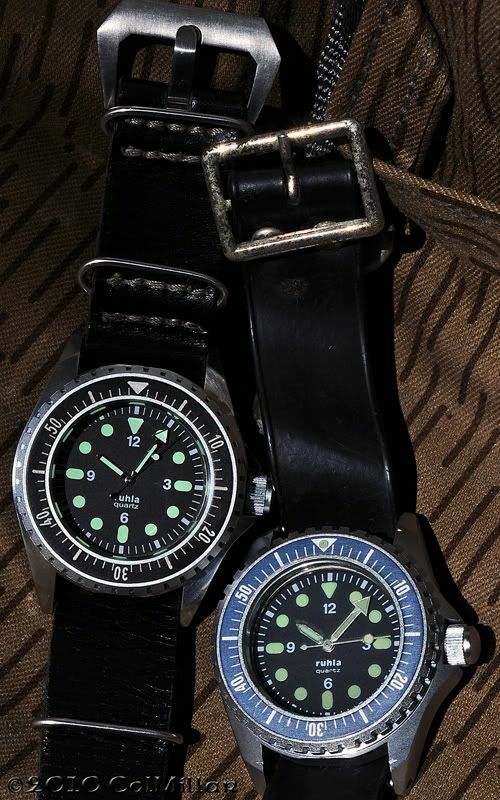 Looked at both watches under UV light and it seems #1562 either has very weak lume on the dial or the dial is painted with fluorescent paint only and no lume applied. The hands do have lume and the glow persists briefly after charging. No. 571 seems to have either had the dial re-lumed or the initial lume application was pretty sloppy - it's a bit better than some MOD re-lumes, but not by much.